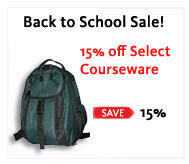 A Discount on Great Autodesk Courseware! For those of you who like to read your way to knowledge (I have my hand up here as well), you should definitely take a look at the Autodesk Official Training Courseware. Here you will find some great titles like "The Essentials of Customizing AutoCAD" and AutoCAD 2008, Transitioning from AutoCAD 2007 (which would go into things like Annotation Scaling!) along with courseware on all your Autodesk products. And believe me...the guys who write this courseware are definitely in the know! I've attached a sample chapter of the "Essentials of Customizing AutoCAD" curriculum. This chapter focuses on Workspaces and the CUI. You'll also get this courseware if you take a class from an Autodesk Training Center. For those of you who know me, I am a big fan of all things ATC. That's exactly where I go when I need to learn a new Autodesk product (like Inventor). I hope you are enjoying the week! It's hard to believe the NFL is up and running. Our hearts and thoughts definitely go out to Kevin Everett and his family. It's so very sad when these young men get hurt especially as seriously as Kevin did.